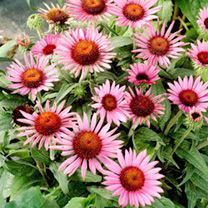 A fantastic range of rare and unusual coneflowers the plant that everyone is talking about at the moment! Theyre far removed from the traditional varieties, as tissue culture developments have produced colour-break after colour-break, producing new colours that are simply out of this world. 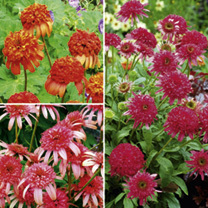 Collection contains 3 plants (1 of each variety):Cranberry Cupcake – Large, cranberry-coloured flowers. Height 55cm (22).Secret Lust – Orange-red cones and contrasting light pink rays. Height 78cm (31).Secret Passion – Bright, flamingo pink cones and contrasting lighter pink rays. Height 78cm (31). Supplied as well established plants in 1 litre pots that can be planted straight out into their final positions in the garden. A unique blend of colours and flower forms, including varieties with upright, spooned or reflexed petals. Ideal for cutting and drying. Flowers July-September. Height 75cm (30). Back of border variety. A unique blend of colours and flower forms, including varieties with upright, spooned or reflexed petals. Ideal for cutting and drying. Height 75cm (30). 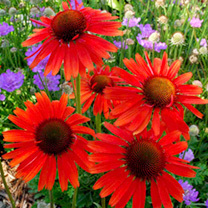 A fantastic range of rare and unusual coneflowers – the plant that everyone is talking about at the moment! Theyre far removed from the traditional varieties, as tissue culture developments have produced colour-break after colour-break, producing new colours that are simply out of this world. Ideal for creating an eruption of colour in late summer borders! Flowers July-September. Supplied in a 9cm pot. Green Eyes – Magenta flowers, with indented green centres that mature to rich orange. Height 75cm (30). 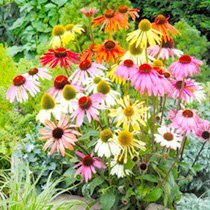 A fantastic range of rare and unusual ‘coneflowers’ – the plant that everyone is talking about at the moment! Theyre far removed from the traditional varieties, as tissue culture developments have produced colour-break after colour-break, producing new colours that are simply out of this world. Ideal for creating an eruption of colour in late summer borders! Flowers July-September. Supplied in a 9cm pot. Hot Lava – Wide petals of deep orange-red, that tint to a deeper red at the base, with an orange cone. Height 82cm (33). 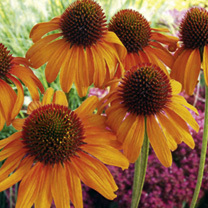 A fantastic range of rare and unusual ‘coneflowers’ – the plant that everyone is talking about at the moment! Theyre far removed from the traditional varieties, as tissue culture developments have produced colour-break after colour-break, producing new colours that are simply out of this world. Ideal for creating an eruption of colour in late summer borders! Flowers July-September. Supplied in a 9cm pot. Lilliput – Flowers are deep rose purple and fragrant, mounding habit, dwarf form, attractive to pollinating insects. Flowers July-September. Height 30cm (12). 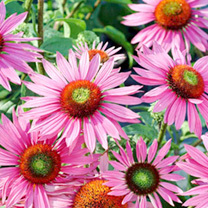 A fantastic range of rare and unusual ‘coneflowers’ – the plant that everyone is talking about at the moment! Theyre far removed from the traditional varieties, as tissue culture developments have produced colour-break after colour-break, producing new colours that are simply out of this world. Ideal for creating an eruption of colour in late summer borders! Flowers July-September. Supplied in a 9cm pot. Tiki Torch – Dazzling orange petals surround a prominent orange-red cone. Height 60-75cm (24-30). 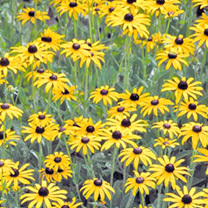 Bushy plants producing many flowering stems and masses of bright yellow, single flowers with fine, delicate, narrow petals and black centres. We counted over 100 flowers on one plant in our 2010 trials! Height 70cm (28). HHA/HP – Half-hardy annual/Hardy perennial.